Providence Art Windows is pleased to announce that its next installation series will be on view from June 18- November 5, 2010. The art and art installations presented in nine downtown windows are produced by Constance Allen, Jenine Bressner, Jennifer Daltry, Heather Freedman and Greg Kozatek, Holly Gaboriault, Michael Guadagni, Delia Kovac, Adam R. Thime and Leigh Waldron-Taylor. Please join us for a walk with the artists on Gallery Night, Thursday, July 15th, at 6 PM. Starting point and reception is at Heir on Westminster Street. 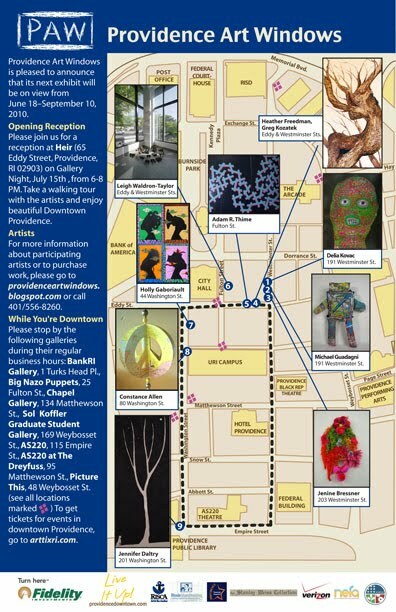 If you are unable to attend, please download the map above and take a tour of the art and downtown Providence. Born from detritus, DOMESTICATED, is part elegy and part western cultural mashup. DOMESTICATED pairs reimagined ancient Greek drama masks and mediæval helmets (Armets, Barbutes, Bascinet, Great Helms, Hounskulls, etc.) with images of the internet age. The protection, artifice, and individual dislocation of the ancient artifacts are distant cousins to our relationship with our contemporary selves. Created with humble materials, second hand cloth and overstock paper, DOMESTICATED accentuates the seams and genealogy of contemporary culture. Delia Kovac was born in Milwaukee, WI. She received a BFA in Printmaking from the RISD and an MFA from Rutgers University. She is a former member of the underground Providence feminist art collective the Hive Archive. She worked in printshops on three continents including The Brodsky Center and the Singapore Tyler Print institute. She was a member of the video/music collaboration The Triple M Threat, which toured the Eastern seaboard. Her work has been show internationally including P.S.1 Contemporary Art Center, The Hunterdon Art Museum, The Wunderground Show at the RISD Museum, Alexander Gray Associates, James Yarosh Associates, Gallery Angiel and 5 Traverse Gallery. Her work is currently on view in the Boston Drawing Project at Joseph Carroll and Sons Art Gallery. Delia Kovac lives and works in South Providence, RI. I love things of a fantastical nature; based in reality but pushed beyond the limits of what we conventionally know. A lot of my work is influenced by play: toys, fantasy-based narratives, role-playing games (and associated with the nerd culture). As a professional band photographer, I'm also heavily influence by music and the aesthetics of band culture in Providence. These seeds of inspiration grow in my mind to become tangible playthings unlike any others that I know. 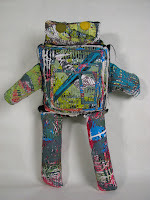 I re-purpose existing fabrics by creating new surfaces and using them to construct my characters. I hand-draw detailed patterns that I then screen print in layers, and I draw stitches and applique to create new textiles. Why are we fighting when we’re on the same team? I'm frustrated by the inescapable theme of "Humans vs. Nature." 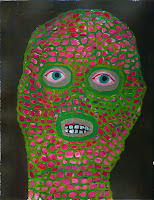 To tolerate it, I have to find humor in the inanity of this idea, and its failure to recognize humans as nature. Though it might be possible for people or other animals to survive in mostly- synthesized environs, such a state of existence would be an artificial life. The most inspiring works I've witnessed have all been naturally- occurring ones. I aim to make things that reflect my respect and awe for the natural world, my quiet sadness for its/ our uncertain future, and the irony of humans trying to control and recreate nature itself in artwork that can only strive to be as beautiful as authentic life. Jenine Bressner wants to see things she has never seen before. She aims to satisfy this wish by drawing with glass rods in a torch flame, laser cutting textiles, and by working in other various media. She studied glass at RISD and Digital Fabrication at AS220, through MIT. 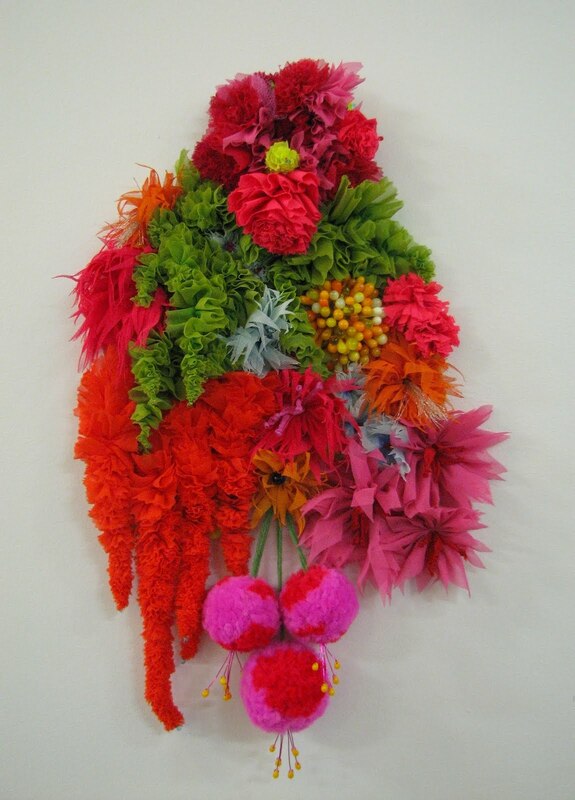 Jenine was awarded RISCA's Fellowship of Craft in 2009 and is currently preparing for a show next year at the Houston Center for Contemporary Craft. To learn more about Jenine, please go to jenine.net. Shelter is a common theme, as well as necessity, shared by all lifeforms. Architecture peppers our planet, taking the form of nests, cocoons, hives, apartment complexes and high-rises. As humans, we find comfort in the idea of home. It is a place to retreat to, and a place to start out from. We rest, we reload. Sometimes, after we've done all the growing we can do in one place, we get pushed out of the nest. We must move forward towards new opportunities for growth. All aspects of ourselves, as well as our habitats, experience the unavoidable change found in moving through the stages of life. Opened cocoons speak of a stage of life completed. They are left behind as time moves on, and serve as beautiful sculptural reminders of time past. A sense of history, as well as future, is created. Growing up in the midwest, Heather Freedman relocated to Providence to attend Rhode Island School of Design. Graduating in June with a BFA in Illustration, Heather's work explores themes in nature and movement. She enjoys experimenting with a variety of 2D and 3D media. A background and continued interest in classical dance adds an aspect of performance to her work. Heather is currently serving a summer term at CityArts with AmeriCorps, where she is teaching a creative movement class and is enjoying sharing art with young people. Heather loves trees, dancing, and a leisurely coffee break. Greg Kozatek was born and raised in Apple Valley Rhode Island, where he consequently spent most of his childhood picking apples. Greg attended Smithfield High School and now a graduate of the Illustration Department from the Rhode Island School of Design, Greg hopes to work as a part of a creative design/production team to create work for film, television and theater. Finding inspiration in street art and murals, I set out to create a work that drew from these interests while utilizing my personal style and techniques. The cross-hatched patterning employed in this painting is something I have explored and developed over the last few years. I create a jumble of seemingly random lines that come together to produce an overall unified image. Capturing a sense of randomness, when there is nothing random about it, while maintaining the flowing movement of the design through the entire work, has always been my ultimate goal. The large scale and bright colors of the painting were essential: I want the viewer to be absorbed by this painting, maybe even overwhelmed by it. I feel as though this piece has found a good home for the summer here on the streets of downtown Providence. Adam R. Thime is a 2009 graduate of Wheaton College in Norton, Massachusetts. He graduated with a degree in studio art and a second degree in biology. Since finishing at Wheaton a year ago, he spent eight months working for the Cape Cod National Seashore in North Truro, Massachusetts. 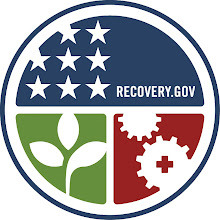 He is currently living in Marlborough, Connecticut and working for the Department of Environmental Protection Inland Fisheries Division. 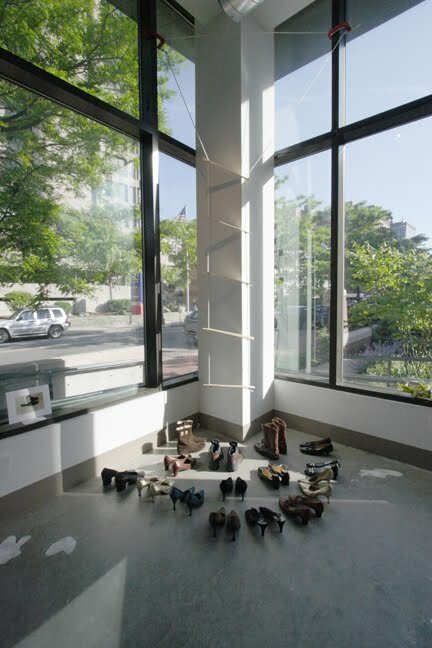 This work continues themes begun in I dream of boots and an army of women installed at mobius/Boston in 2009. Here I explore a child's fantasy of the feminine, it's imagined power to enthrall, and as means of escape. I dedicate the piece to Louise Bourgeois. The artist lives and works at AS220. More work can be seen at leighwaldrontaylor.com. My work is about telling stories, creating new folktales and new worlds. Much archeology and research goes into my work and is essential in order to find inspiration in the traditions and folklore from different cultures. I find their different perspectives, concerns and rituals have transformed my work over the past several years. Crossing the bridge between words and images, as I do with mask and puppet making, one thing always affects another and triggers something new. The work in this window is an exploration of an African folk art series exploring pattern, color and its iconic shapes to evoke new stories. The primary themes in African art are based upon nature, humanity and roles people play which greatly influence my work. 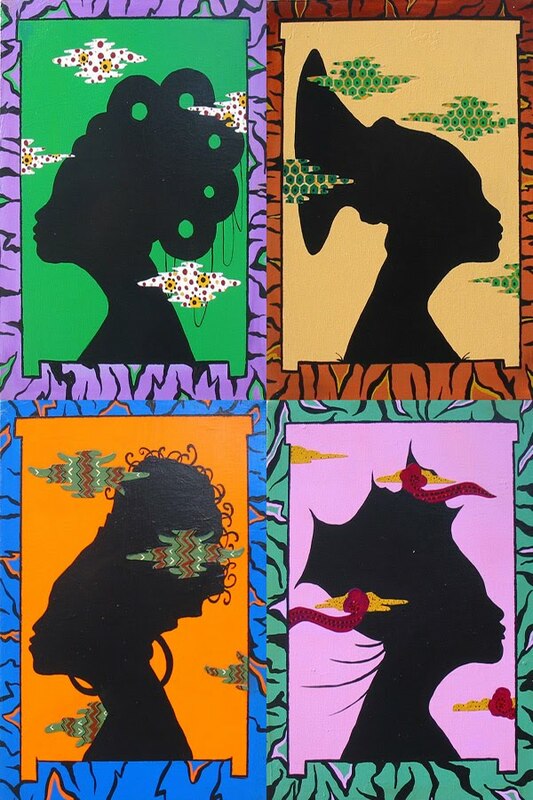 The Silhouettes of Sudan were a series of four paintings inspired by the strong African silhouette and the cultural identity of hairstyles both past and present. Tree of Forgiveness tells a story of the central figure dressed in royal robes leaning on a tree bearing weeping masks. As in many cultures, it is a belief that everything in this life has a spirit inhabiting it. So it is hard to tell if the man has transferred his grief to the tree or is comforting the tree with his own hand placed upon it. Jungelaro Rising began as a study of the expressive, sometimes playful, and evocative art of African masks. The power of masks can carry spirits and possess the people wearing them in both community and private ceremony where rituals and rites of passage are performed. This painting illustrates where these enlarged masks as hot air balloons used for leisure, not ceremony, rising above a landscape to some unknown destination. Pachebel’s Canon in D Major is a piece about the connection of people, one holding and one being held inspired by the music of Pachebel. I have always believed that storytelling feeds the imagination and gives people power. When I was very young, I filled my days writing and drawing pictures for my stories, long before I knew that was what an illustrator did. I am an author, painter, illustrator, designer and sculptor who finds the unimaginative rather dull and a certain elegance in what may exist. Graduating from Rhode Island School of Design with a BFA in Illustration, my first love was always archeology. I became fascinated with Egypt as a child and mummified meat for every science fair. It was inevitable that I would find inspiration in the other histories and cultures, African folktales and stories from places such as Japan, Indonesia, and Mexico. Ceremonies, rituals, costumes and music create new characters and worlds as I cross the bridge between words and images. Making Javanese rod puppets and both African and Balinese masks became a new direction to explore these ideas. Working in theater and ballet allowed me to work on larger scales and apply my interest for set and costume design. Color, pattern and play are central themes in my work. I write and illustrate children’s books and have created a series of Etiquette Collage books satirizing Victorian social codes and timely tips. As a graphic designer, I create window displays and graphics for a variety of clients, including small businesses, restaurants, non-profits and artists. My work is exhibited in galleries throughout New England. Currently I am working on two children’s books and a series of collage books and creating paintings for future exhibitions. My studio in Providence is shared with two felines, Mexican music in the air and steaming cups of mango tea. This installation will grow and change through the summer season. Constance Allen is a woman of a certain age who lives here in Providence in elderly housing. When Bush began talking War, it triggered a passion for peace and the peace symbol and a need to share it that has ruled her life since. 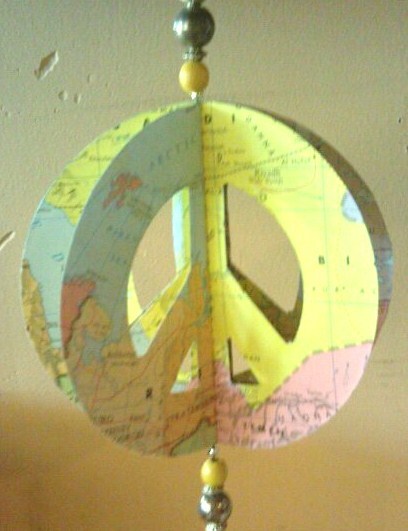 First came huge painted cardboard peace symbols wired to chain link on highway overpasses. 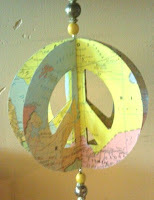 Then smaller painted peace symbols on skewers for the front yard and garden. Next, a professionally applied vinyl peace symbol for the roof of the car, visible to satellite cameras and drivers in tall vehicles on the road. Fast forward to red white and blue paper plates with peace symbols painted on them, wired to the back of stop signs. Somewhere in there came thousands of little plastic "talking soldiers" with a heart on the bottom of their boots reading "Bring Me Home" which were left randomly to be found all over Providence. And now, the spinning 3D peace symbol which, working like a prayer wheel, spins and sends love and peace wherever it is needed. A "Flying Peace Tree in Bloom" mobile spun in the URI summer show last year. Now you can see the peace mobiles in PAW windows on Washington Street in the URI library windows. Peace Rules. Pass it on.